New 2016 Niche Road Wheels: Ascari M166/M167, Pantano M171/M173, Turin M169/M170, Anzio M164/M165. Machined, brushed, silver, gloss black, bronze, chrome. Niche Road Wheels might have a misleading name. “Niche” might make you think that the brand only caters to the select few elite, and yet Niche has something for every driver’s tastes. 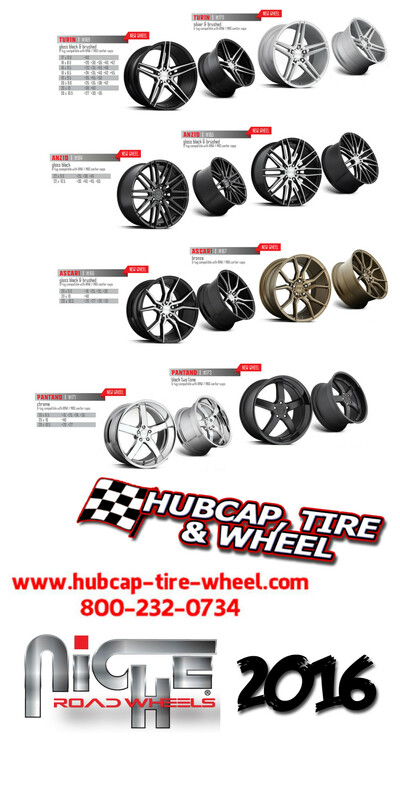 They have a range of rims in all kinds of styles, and they all feature outstanding designs and top performance quality. Their different wheels provide options for casual drivers, custom enthusiasts, street cruisers, professional racers, and everyone in between. The Sport series has a sturdy cast Monoblock construction with no lip, creating an aggressive concave faces, staggered fitments, and massive caliper upgrades; the Track and Racing series are built for the most demanding performance conditions; their 3-piece Forged series caters to the most selective custom fanatics; and then there’s the 1-piece cast Touring series, for everyday drivers who want that exotic 3-piece luxury look. There’s a wide range of new one-piece wheels for 2016, and they’re all high-quality rims with edgy style and top-of-the-line construction. Turin M169/M170 has a sleek and modern design, with slim, spiky spokes. It’s a rim that has clean lines for maximum classiness. This wheel comes in finishes of gloss black with brushed spokes, or brushed silver. Anzio M164/M165 gets a bit less restrained, getting more aggressive with its spoke pattern. The Anzio rim is available in solid gloss black or gloss black with brushed spokes. Next is the Ascari M166/M167, which has a high-end luxury look to it (at a much more reasonable price tag). This rim gets fancy, with a design that’d be right at home on a Ferrari; it comes in gloss black and brushed, or in a more exotic bronze finish. Lastly is the Pantano M171/M173, which is has a simple, flat, clean-cut spokes for a design that’s straight-up bold. To see all of Niche’s rims: Niche Road Wheels. To order Niche wheels for your vehicle, call 1-800-232-0734. Our team of experienced wheel and tire guys have all been in the custom wheel business for decades. With their assistance, you’ll definitely find the wheels and tires you need with the style you want. Getting the right fitment is most important of all, so let us help you in picking out the wheels and tires that best fit your car, truck, or SUV. We guarantee fitment!